There are so many ways to jazz up chocolate-covered strawberries beyond the simple dip. I’ve made penguins, footballs, and now, these adorable dreidels. A strawberry is naturally shaped like a dreidel, but trimming the fruit makes the resemblance even stronger. Let the chocolate dry before you paint the Hebrew letters on them, lest the two chocolates run into each other. And in order to avoid touching the strawberries as you’re covering them in chocolate, I recommend sticking two toothpicks into the stem end and holding them while painting the chocolate on the fruit. Using only one toothpick allows the berries to rotate annoyingly as you paint on the chocolate, but using two keeps them in place. 1. 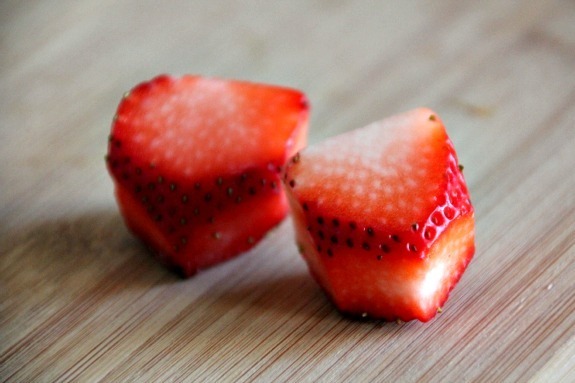 Using a paring knife, slice a sliver off each side of strawberry to make four straight sides. Then, starting one-third up each side, diagonally slice slivers off of bottom of each strawberry to make a tapered point that resembles a dreidel’s point (see photo below). Stick two toothpicks into stem end of each strawberry. Line baking sheet with parchment paper. 2. Melt ½ cup semisweet chocolate chips and stir until smooth. Holding toothpicks of one strawberry, dip in melted chocolate, then use small knife or spoon to spread chocolate over strawberry until completely covered. Transfer to prepared sheet pan and repeat with remaining strawberries. (You may need to reheat chocolate for a few seconds if it starts to harden, or melt more if you run out.) Transfer sheet pan to refrigerator until chocolate is set. 3. Melt ¼ white chocolate chips. 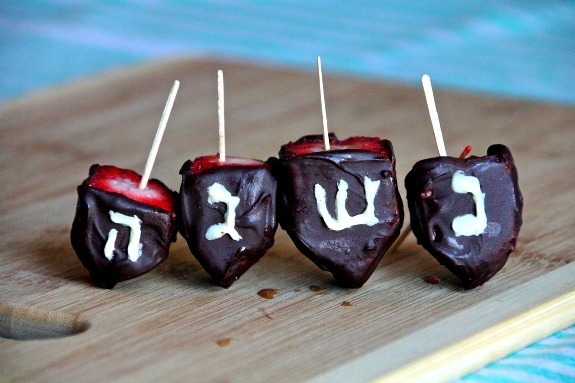 Using a toothpick, paint one of the four following Hebrew letters onto each berry: nun, gimel, hey and shin. Return strawberries to refrigerator until letters are set. Serve.